When you make your own cleaning products you can do several things at once, including save money, time and possibly help the environment (depending on the ingredients you choose for your cleaning supplies). However, just as in high school chemistry class where you were warned to keep your goggles on and always follow the rules in the laboratory, there are certain rules you must follow to make sure you are safe as you make these homemade cleaning products. Mixing chlorine bleach with ammonia, an alkali, or vinegar, an acid, can create toxic fumes which can be deadly. Therefore, do not mix chlorine bleach with any acids or alkalis. If in doubt about the ingredients in various products, read the ingredients label or do not mix them together. Common household acids used to make homemade cleaning products include vinegar and lemon juice. Common household alkalis used to make homemade cleaners include baking soda and ammonia. Do not mix acids and alkalis together because this negates the effectiveness of both types of products. All cleaning products can produce fumes, especially when you are pouring and mixing them. Therefore, exercise proper safety precautions by always mixing your cleaning products in a well ventilated area of your home or outside. It is tempting, when you already have all the ingredients out for various homemade cleaning recipes, to try to make a big batch to last quite a while. Unfortunately, this will not save you either time or money in the end. 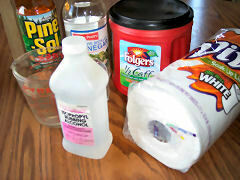 Many cleaning products, especially homemade ones, lose their effectiveness quickly as they break down. Therefore, make only enough of your own cleaning products to last for the next couple of days and then just mix a fresh batch later when you need some more. The final rule when you make your own cleaning products is that just because the cleaning product is homemade does not mean that it is safe for children. Store all cleaning products, including homemade ones, away from children and pets. Before putting anything away label it carefully, so that you know exactly what is contained in the bottle.